"I’m always impressed by what our Senior Design teams come up with each year, and I’m hoping some day soon they’ll find a way to produce about 100 clones of this year’s recipient of our Outstanding Staff Award," said Rob Clark, Dean of the Hajim School, in handing out the 2015 award. 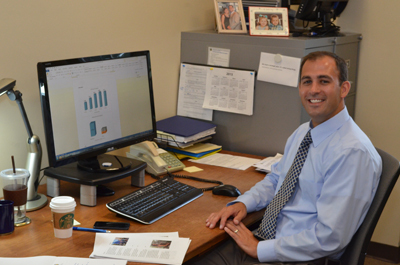 In the five years since he joined the Hajim School, Tony Green, director of finance and administration, has quietly gone about transforming the school's budgeting and administrative processes. "I know that sounds like pretty dry stuff," Clark noted, "but believe me, we wouldn’t be where we are today without him." Green graduated from Aquinas Institute here in Rochester, got an MBA at Syracuse University and later a degree in management information services from RIT. He worked as a sales and marketing analyst for Excellus Blue Cross Blue Shield at its Central New York offices in Syracuse, then as a senior associate at Harris Interactive before coming to the University of Rochester as an associate director of admissions and director of master’s programs at the Simon School in 2008. He joined the Hajim School in 2010. "As many of you know, the school of engineering and applied sciences here was operating at a severe deficit, creating an untenable drain on the University endowment when I arrived here," Clark said. "Tony has been instrumental in getting our books in order, and introducing effective financial forecasting." He has introduced operating efficiencies that have benefited both central office and departmental administrators. A growing school needs solid metrics to assess its performance and establish goals. Green has played a major part in that effort. His recent work in setting up an internal Hajim online dashboard has provided an accessible way for Hajim faculty and staff track our progress. "And the best part of all: He’s a really nice guy," Clark said. Green's colleagues at the Hajim School central office describe him as a great young leader, personable, even tempered, and responsive. Department administrators know he will listen to their input, and is the go-to guy when they’re having trouble getting an issue resolved with HR or other administrative branches of the University.